SMYRNA, TN -- Oct. 26, 2015: Production begins today in Smyrna for the updated 2016 Nissan Altima, Nissan’s top-selling vehicle. Nissan’s Smyrna, Tennessee assembly plant boasts production of two of the best-selling vehicles in the U.S. – the hot selling Rogue compact crossover that was redesigned for 2014, and the Altima that starting today is getting a mid-cycle refresh for the 2016 model year. "Altima is Nissan’s bellwether vehicle in North America, so we take great pride in getting it right and continually improving," said John Martin, senior vice president, Manufacturing, Supply Chain Management and Purchasing, Nissan North America. "All of our North American teams are aware of how important the mid-size sedan segment is to this region, and having five straight years of continuous sales growth in such an intensely competitive segment has become a point of pride for us." The first Altima launched in Smyrna in 1992, and the popular mid-size sedan has been built there ever since. Brisk sales by 2004 prompted Nissan to expand production to Smyrna’s sister plant in Canton, Mississippi. 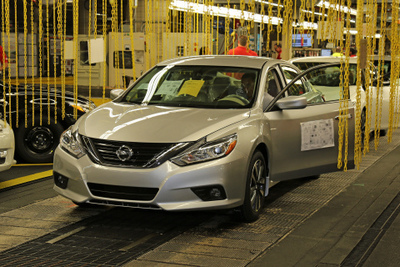 To date, over 5.5 million Altimas have rolled off the two U.S. plants’ production lines. Canton will launch production of the 2016 Altima in one week. Just three years after its total redesign for the 2013 model year, the Nissan Altima has been transformed again in one of the most extensive mid-cycle product makeovers in Nissan history. Updates include a refreshed exterior following the new Nissan "Energetic Flow" design language introduced initially with the MY15 Murano and followed by the all-new Maxima. Design is highlighted by a redesigned front and rear fascia, grille, headlamps, lower and wider taillights, new 17-inch and 18-inch machine-finished aluminum-alloy wheel designs, refined interior design, class-leading* standard fuel economy of 39 miles per gallon highway (2.5-liter engine, except 2.5 SR), addition of a new, sportier Altima SR grade and much more. Nissan Safety Shield technologies available on the 2016 Altima include Forward Emergency Braking, Intelligent Cruise Control, Blind Spot Warning with Rear Cross Traffic Alert, and class exclusive available Predictive Forward Collision Warning. In 2014 the Smyrna plant became the highest-producing automotive assembly plant in North America, with more than 648,000 vehicles assembled. The operation employs more than 8,400 people and produces the all-electric Nissan LEAF, Pathfinder, Maxima and Infiniti QX60 in addition to the Rogue and Altima. The new 2016 Altima will go on sale at U.S. Nissan dealerships in November.